You don't know whats the right choice between a GPS and a Bluetooth Tracker? Learn now all the differences between them and take the best decision! In today’s rapidly changing times, one might easily lose sight of all the different technologies available. Maybe you find yourself in a similar situation, wondering what is the best pet tracking device for your own pet. Is it a GPS tracker or a Bluetooth tracker? This article explains clearly the differences between a GPS tracker and a Bluetooth tracker. It also illustrates the advantages and disadvantages of the two devices, to make it easier for you to decide which tracker option to go for. What are the advantages and disadvantages of a GPS tracker? Unlimited reach: even when your dog is located thousands of kilometres away, you can still locate his exact position. The following example can better illustrate the way in which a GPS tracker can help to precisely locate your dog. Your dog just ran away and he has a GPS device attached to his collar. There is no limitation for the reach of the GPS tracker. This means that your dog might find himself not only kilometres away, over the border, but he can also be detected on very far distances. You will always know the exact location of your dog via your smartphone. Therefore, you are not dependent on the external help of others and you are able to hug your dog again in no time. Virtual Fence: you can set up a predefined fence, for example, around your house. As soon as your dog will leave this virtual safe zone, you will receive a notification on your smartphone. What are the advantages and disadvantages of a Bluetooth tracker? If the pet is located outside of the 10 meter radius, the device has to fall back on an external, foreign smartphone (Requirement: Location-Service + Bluetooth of the foreign smartphone are active and the same Bluetooth App is installed), so that the localization feature functions. 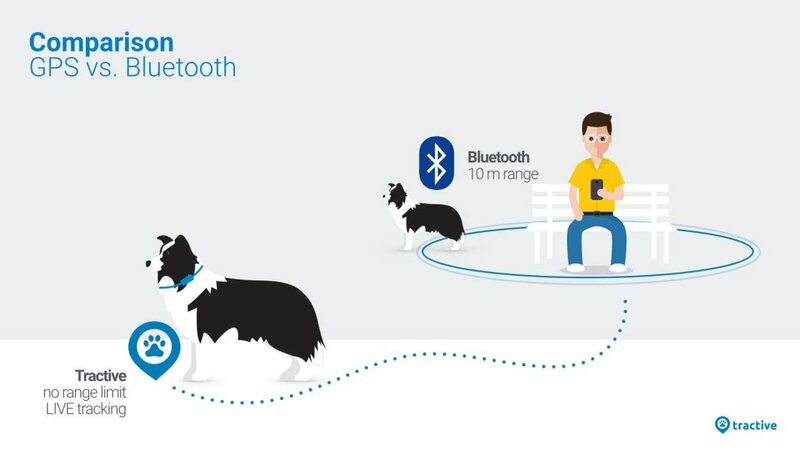 When your dog is located inside the Bluetooth reach, you are able to track your dog. Should your dog be located outside of this reach, then you are not able to track your dog with a Bluetooth tracker any longer. Only when your dog is located inside the Bluetooth reach, you are able to find him. Outside this reach, you are powerless. Your dog just ran away and he is located outside the 10 m Bluetooth reach. The Bluetooth tracker needs to connect with a foreign smartphone of another person, who has the matching App X installed and the Location-Service as well as Bluetooth functions on. The tracker will determine its position based on the smartphone position. Only then the tracker can send you its position. The most important difference is that, with a GPS tracker, you can always locate your dog, whereas with a Bluetooth tracker this is not the case. You will have to be lucky, so that a stranger in the area has the same Bluetooth tracker app installed as you have and that he has his Location-Service and Bluetooth activated. Only if and when these 3 conditions are met, your Bluetooth tracker will be able to send data to your smartphone. Should one of these requirements not be met, you will not be able to locate your Bluetooth tracker and your dog. Due to this reason, Bluetooth trackers are not the ideal devices for tracking your pet. What is the right tracker for me? You can use both tracker types. In the case of a GPS tracker, you are not dependent on external persons and you will be able to track your dog with no exception. When using a Bluetooth tracker, you are highly dependent and limited by the small reach. Should your dog be located inside the 10 metres of your smartphone, you’ll be able to track him. But when your dog runs away, he may travel much farther than the 10 metres range of the Bluetooth tracker, because he is discovering the world on his own. The Bluetooth tracker functions very well for locating objects in your immediate reach, for example, for finding your keys or your bag inside your house. But when it comes to locating the exact position of your pet, the Bluetooth trackers are only partly effective, due to their limited operational range. 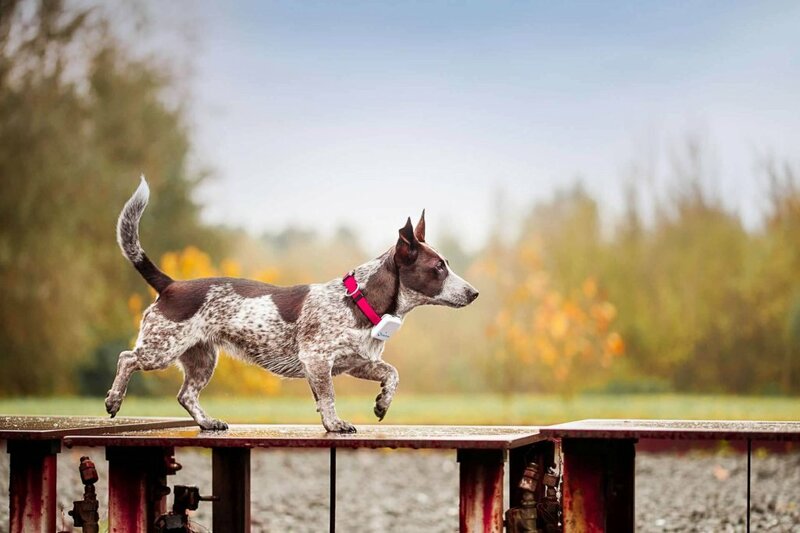 A GPS tracker is the best option for tracking the location of your pet! Feel free to test how Tractive GPS works with our Demo-Mode in your browser or in our free Tractive GPS App.